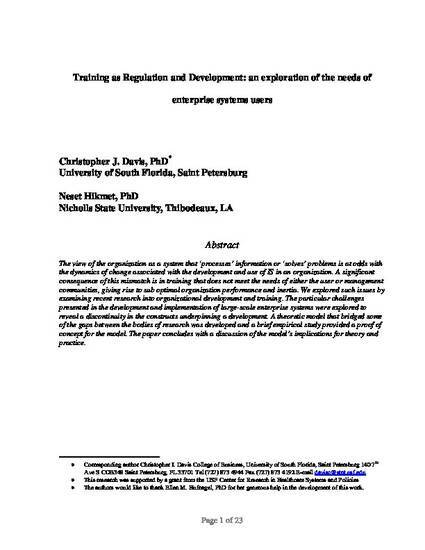 Training as regulation and development : An exploration of the needs of enterprise systems users. The view of the organization as a system that 'processes' information or 'solves' problems is at odds with the dynamics of change associated with the development and use of IS in an organization. A significant consequence of this mismatch is in training that does not meet the needs of either the user or management communities, giving rise to sub optimal organization performance and inertia. We explored such issues by examining recent research into organizational development and training. The particular challenges presented in the development and implementation of large-scale enterprise systems were explored to reveal a discontinuity in the constructs underpinning a development. A theoretic model that bridged some of the gaps between the bodies of research was developed and a brief empirical study provided a proof of concept for the model. The paper concludes with a discussion of the model's implications for theory and practice. NOTICE: this is the author's version of a work that was accepted for publication in Information and Management. Changes resulting from the publishing process, such as peer review, editing, corrections, structural formatting, and other quality control mechanisms may not be reflected in this document. Changes may have been made to this work since it was submitted for publication. A definitive version was subsequently published in Information and Management (2008) 45(6) 341-348. doi:10.1016/j.im.2008.04.002. Members of the USF System may access the full-text of the article through the authenticated link.